A very important difference between a very expensive instrument and an entry level instrument is the time spent on adjusting and setting up for playability. Of course there are differences in choices of materials and craftmanship. Remember that Just because you may buy an expensive guitar, you should not expect it to be set up correctly or play at its very best. All of our guitars get a full inspection and a full setup, from the entry level guitars we have to the very best instruments we have to offer. We are experienced techs that setup and repair guitars for our customers everyday. We also care about our guitars and how much our customers would enjoy playing them. We have a super selection of guitars at our shop to choose from. We carry a nice selection of accessories for guitars, drums, violins, horns, reeds, P.A. systems and other musical needs . Banjo, Piano, Vocals and Drums. We teach a wide range of music styles, from Bluegrass , Rock, Country, Jazz, Worship music, Oldies and New Music. We teach people of all ages ! Private lessons are all 1 on 1 customized for the student. 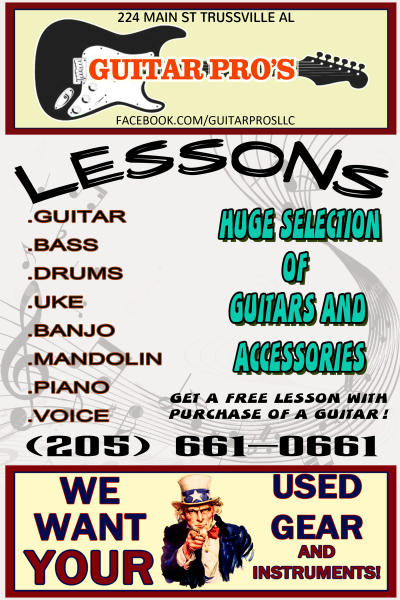 Our lessons are priced at $25 for 30 minute lessons or $40 for1 hr.